I’m still working on my New Years resolution, eating breakfast at home. Can’t say it has been a daily success but I’m still trying! Weekend breakfasts with their lack of time constraints are an entirely different matter, of course. Eggs (sorry Johanna) tend to feature quite heavily at these meals. Poached, fried, boiled, scrambled – I love them all. Perhaps my favourite way of eating them in the morning is by making what the Finns call munavoi and D calls “egg in a cup”. Munavoi translates as egg-butter and that’s exactly what it is: hard boiled eggs mixed well with softened butter to create a smooth, velvety eggy spread. Yum! It is, however, very buttery. I generally prefer to eat lighter than this and so came up with an alternative which I now actually prefer to original munavoi. The following is less of a recipe than an idea but it makes a lovely, fresh egg spread which is perfect on wholewheat bagels or rye bread. Add egg and cottage cheese to a cup and use a fork to break up the egg and mix well. Season carefully and stir in the parsley. PS We’ve had a little snow recently. Not quite enough for snow angels but exciting nevertheless! Gosh, I was just mentioning that same resolve in my blog the other day! And it was about eggs too! The egg spread looks like a lovely healthy option. And I *love* your Moomin mug! mmm i bet that would be a great lunch time sandwich too! and happy for you to be getting snow! it always seems you find the lovely in all of your weather! Pille – It’s my favourite one. Have 5 now. Want them all! Kalyn – Warm or cold works. The egg tends to cool very quickly when mixed with the cold cottage cheese anyway. We had a heavy snowfall here yesterday, today a bit more, and now it’s raining…:( But I managed to get som pics of all that glorious white anyway. I’ve never heard of this before. I like the idea of mixing it with cottage cheese – what a satisfying breakfast. Love the snow picture – I’m heading up to Aberdeen tomorrow for work and was hoping to see some snow. Again you have taught me something new today Wendy! No wonder you are a “teacher”! It sounds great and I will try as soon as I get some bagels in the house. The only thing as an egg spread here is like an egg salad, which I love on whole wheat toast! But I like this idea for a new twist on breakfast. Glad to hear you are still attemping to have a bite to eat before you set off on your day! Antonia – Don’t think they have any snow in Aberdeen, unfortunately. Have a great trip anyway though! Deb – Is egg salad what we call egg mayonaise, I wonder. This looks right up my alley – a good amount of protein for breakfast-time, too. Glad you’ve lightened it. 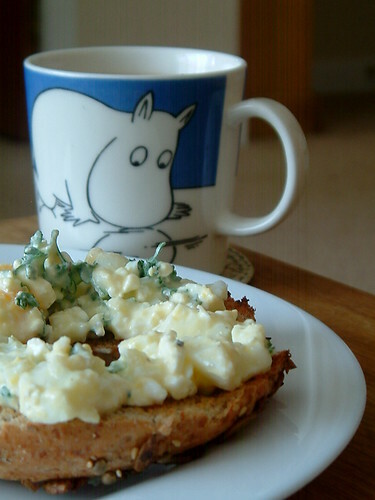 Your moomintroll (apologies for spelling – can’t find my copy anywhere…) cup is just gorgeous! My Mum used to make the butter version for me when I was a little girl in Scotland. We ate it just warm on cold mornings and sometimes after school on snowy afternoons. I’m going to try the cottage cheese idea 🙂 Yum! I hadn’t heard of this before and your lighter version sounds rather nice. Thanks for sharing and you may keep the snow. Looks very pretty, but very cold too. Now why didn’t I think of that! Excellent idea Wendy. This is just my kind of breakfast. I find I need a good dose of protein at breakfast, often have eggs, but sometimes struggle to find new ways to use them. I even have all the ingredients in my fridge. I think this shall be breakfast tomorrow. Thanks! LindaH – I’d advise against buying a moomin mug as, if you’re anything like me, one won’t be enough and you’ll want to collect them all! Kathryn – It was one of those dishes that just invented itself. Enjoy! I did try to eat eggs at a time in my life when I was feeling open to change but still couldn’t stomach them – however if I could I would eat your version of egg butter and I would buy lots of cute egg cups – I like your cup by the way! That sounds great Wendy! With that winter Highland weather, you need something that packs a punch for breakfast! What a great idea Wendy to add cottage cheese and very healthy it sounds too! Looking at that snow you need something warming to kick start the day! I have no problems with eggs! This buttery version sounds delicious. 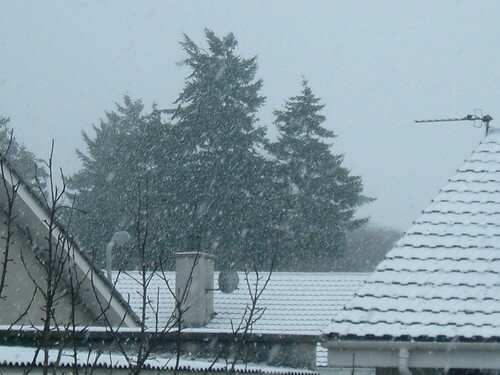 Pretty picture of the snow. I love eggs for breakfats…and bagels! I just never take the time! Your healthy version looks good. I make something similar but it’s more of a lunch sandwich spread, instead of butter, I use low-fat mayo to mash with the hard-boiled egg yolks. I chop up the egg whites then mix it in. Snow for you, non-stop rain for us in Sydney. Johanna – Yeah, egg cups are cute. So small! Rosie – It’s all gone now. Fingers crossed for more! Katie – Only at the weekends do I.
Maryanne – A wee bit! Nora – Egg mayonaise is a really popular sandwich spread here too. Especially with cress. Hi Wendy, That is a good idea for lightening up the eggs, I will have to try it. I usually have both in the fridge. I know what you mean about the buttery eggs. My mum used to make these for me. She had a special llittle bowl with chicks on, that the eggs was chopped in, boy, that brings back memories! Can you tell me the name of the illustrator whose work is featured on your home page? That would be the flying angel + dog. Julia – If you click on the Artwork page (link at top of this page) it will tell you all about my friend Faye who painted this picture.